The Lowcountry Autism Foundation is set to shuck things up over some hot steamy oysters for a cause at their fourth annual Oysters for Autism event at Bowens Island Restaurant on Sunday, November 12th from 4 p.m. to 7 p.m. Tickets are $25 in advance and $30 at the door. Tickets may be purchased online prior to the day of the event at www.lafinc.org. The menu for the event includes oysters, chili and hot dogs and also includes non-alcoholic beverages. Beer and wine will be available for purchase. Local artist Jack Triebold and local alternative rock band Bateman’s Stud Farm will provide entertainment. The event will also feature a silent auction with items ranging from generous gift certificates to businesses in the area to golf outings. Sponsors include title sponsor Stokes Volkswagen as well as Motley Rice, Lucey Mortgage, Cresswind Charleston and more. The Lowcountry Autism Foundation’s strives to improve the lives of families living with Autism Spectrum Disorder. They provide clinical diagnostic assessments and programs to support families throughout the lifespan. LAF’s goal is to decrease the stress on the family and connect them with every available resource. With a mostly volunteer, multidisciplinary staff LAF has provided over half a million dollars in free autism services while all funds raised stay in South Carolina. More information is available about Lowcountry Autism Foundation and the event at www.lafinc.org or please call Louisa Hopkins at 843-876-0415 for more details. Lowcountry Autism Foundation is hosting a screening of SWIM TEAM, an award-winning feature documentary about a New Jersey YMCA-based, community swim team made up of kids on the autism spectrum. The film follows three of team’s star athletes, boys on the cusp of adulthood, when government services become scarce. The film will be screened on Wednesday, April 26th at Seacoast Church located at 750 Long Point Road in Mt. Pleasant. The screening is free and open to the public. Tickets are available here. SWIM TEAM is a portrait of diverse American families grappling with the problem of “aging out.” Over the course of a year, SWIM TEAM explores the overwhelming struggles they face and the triumphs they achieve as they strive for independence, inclusion and a life that feels winning. Directed by award-winning filmmaker Lara Stolman, SWIM TEAM offers an inspiring look at the power of community. 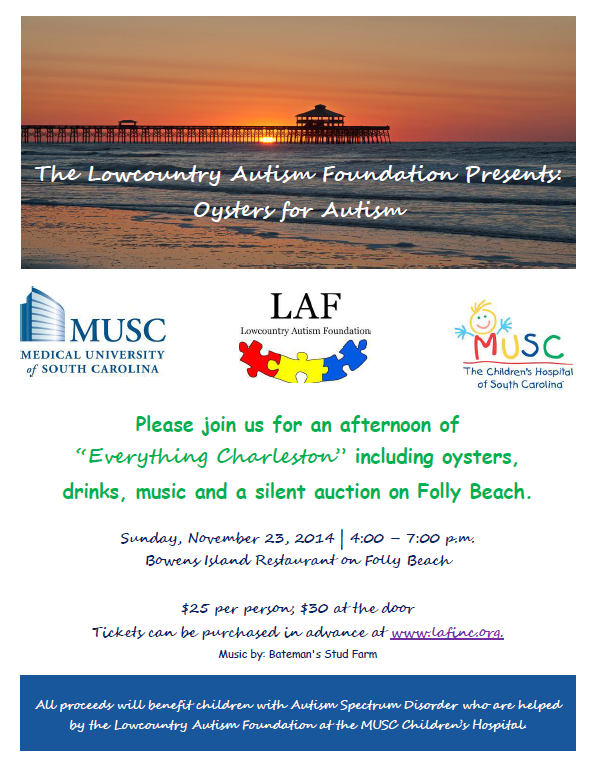 Please join the Lowcountry Autism Foundation for Oysters for Autism on Sunday, November 23rd from 4-7pm at Bowens Island Restaurant! With incredible views, guests will enjoy an afternoon of everything Charleston that includes live music, oysters, drinks and a silent auction. Tickets are $25 in advance and $30 at the door and include oysters and non-alcoholic beverages. Beer and wine available for purchase. Tickets can be purchased by contacting the Lowcountry Autism Foundation or are available online HERE. We hope you join to support this worthwhile cause! All proceeds will benefit children with Autism Spectrum Disorder who are helped by the Lowcountry Autism Foundation at the MUSC Children’s Hospital. Family Support Services is a key component to the continuum of care which helps establish MUSC Health as a Certified Autism Friendly Hospital. Lowcountry Autism Foundation’s mission is to remove barriers and increase access to early clinical diagnosis, and treatment services, for individuals and families living with autism. For additional information, please visit www.lafinc.org.